- 500 g. soft cheese "Bazzotto"
Mix the ricotta in a bowl with the other ingredients for the filling. Then prepare the dough kneaded continuously until it is very smooth and homogeneous. Then cut it into many squares of about 5 cm. side and on each place a 1 / 2 half a teaspoon of filling in, shut the door triangle doing well join the edges, and then turn each triangle around a finger and overlap the two ends. The authentic Cappelletto Romagnolo assume in this way the characteristic shape of a "beret". Do you know this recipe of Emilia-Romagna cuisine? Contribute to this project too! 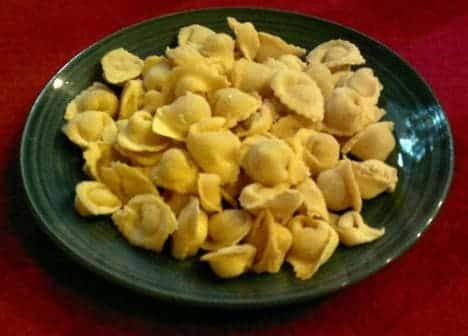 Publish your images of "Cappelletti of lean Romagna style".